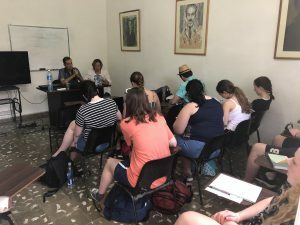 Today our adventures began by visiting Quisicuaba, which is a sociocultural diversity project as well as a place for meal preparation for the community. Quisicuaba was started by a family whose goal was to feed the surrounding community. The building itself was bright and fun and mimicked the people who we met inside. The generous family who started this place did so for the betterment of the community, and has been doing so for many years. In one day they feed over 500 people. Most of these people are part of the LGBT community, are HIV positive, or are alcoholics. What stood out most to me was how deeply these people cared for their community. For them, this did not seem like a job, but rather an activity that they wholeheartedly enjoyed doing. I was amazed that even with the lack of resources that is common throughout Cuba, they were still able to do so much for so many people. It showed such a sense of community and coming together that can be seen throughout all of Cuban culture. 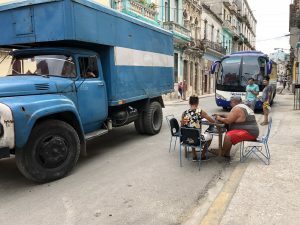 Originally we were supposed to help prepare and distribute meals, but unfortunately, as Cuban life goes, things do not always work out like you plan. Even though we were not able to help, we all still felt such a sense of community just by being there and learning about what they do. In addition to being being a place for meal preparation, Quisicuaba is also a museum. Specifically, it is a social museum, and the only of its kind it in the world. 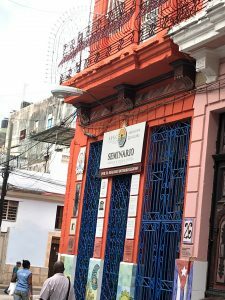 As a social museum, it brings together many different religions and various artifacts that have been common in Cuban culture through many generations. In addition to showcasing these pieces of history, this museum was also set up in the layout of a typical Cuban house. This museum truly made us feel like a part of the culture, both past and present. 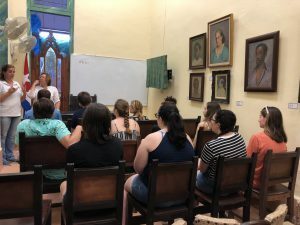 Learning about the religions that make up this diverse culture in what mimicked a true Cuban home gave us even more of a sense of coming together with the Cuban culture. With the extra time that we had as a result of being unable to do some community service, we decided to walk to where we were having lunch instead of taking the bus. Up until this point we had been in mostly nicer parts of Havana, so this walk through a not so nice part of Havana was like seeing the other side of paradise. 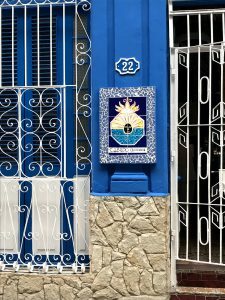 It was interesting to mesh the two different communities that we have seen together: Old Havana, with its touristy shops and relatively well-maintained buildings, and then just steps away a part of the city that may not have looked as nice, but still held so much culture within it. 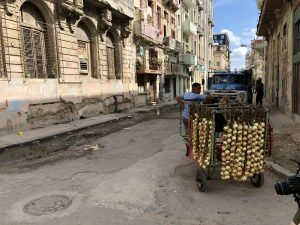 Havana is much like any other city in the world, which has been my main takeaway so far this trip; despite what we might think as a result of some of the negative things that we hear, this country really is not that much different from ours. After lunch we had a lecture about the history of student movements in Cuba given by Jorge Lozano. He was extremely passionate from the very beginning. He detailed the many different student movements throughout Cuba’s history, as well as some history about schools in Cuba. One example of these movements that really stood out to me was the first national student conference held in 1923. At this conference, the students of Cuba came together to implement the ideas of Jose Marti into their schooling. A major idea of the Cuban schooling system was ascension, meaning always going up and improving, and this conference demonstrated one of the best examples of this idea. This lecture showed us how the history of Cuba is really about coming together for a certain cause, which was really the theme demonstrated throughout today. After our lecture we had a different kind of class: a Cuban dance class. Instead of sitting in a classroom and being lectured on a topic, this class had us up and moving. We were all relatively unsure of how this was going to go at the beginning of the class. Despite practicing together the night before, most of us did not consider ourselves dancers and were nervous about how it was going to go. As the class went on, we all really started to get it, and as a result of that really began to enjoy ourselves. What started as awkward movements and being generally unsure of what we were doing turned into an enjoyable experience that none of us will soon forget. 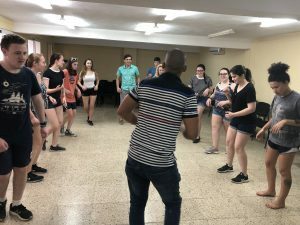 Much like how the community came together with Quisicuaba, and the students came together for various movements throughout Cuban history, we all came together and learned how to salsa. While we did something radically different than the previous adventures of our day, that sense of coming together and being involved in the culture was still present throughout the class. Cuban culture can be characterized in many ways, and one of these ways is by the people coming together for all different kinds of causes. Today we embodied that idea in all of our adventures, making us truly feel like a part of the Cuban culture.